I was unloading my car for work Monday morning and noticed a white box. 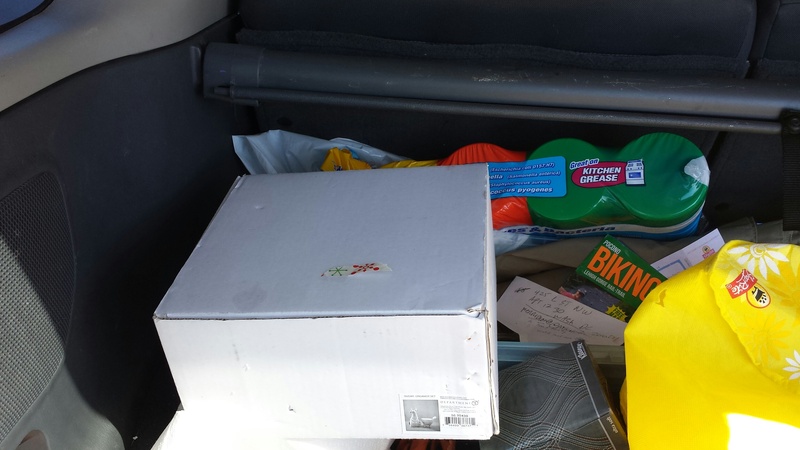 I have a lot of crap in my car, so that wasn’t unusual, but I didn’t remember this particular piece of crap. I opened it up. 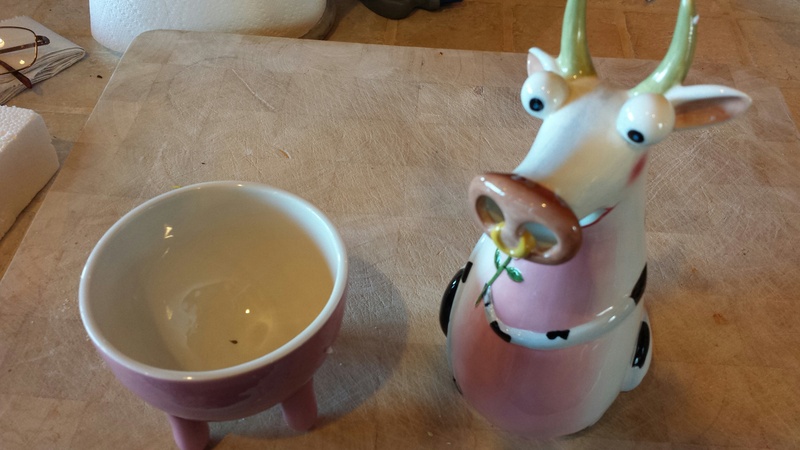 It was a porcelain cow creamer with a sugar bowl in the shape of udders. My classroom has become a repository for cows in alarming numbers. All of unknown provenance. But my car? How are they getting into my CAR? 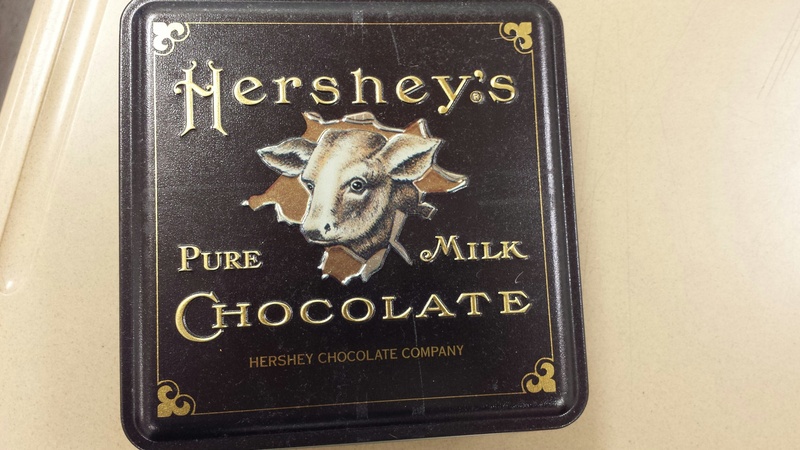 Of course, as per previous cow post, it could have been there for days. Or was it? I accused the usual suspects who all denied everything and/or fiendishly laughed. As usual. I accused my husband of collaboration. I examined the cow for clues.The price tag of $27 was still attached. Who would pay $27 to annoy someone? Then it dawned on me. The only person who would dispose of their disposable income on cows would be someone with my genetic material. When you pour the cream comes out of the nostrils. 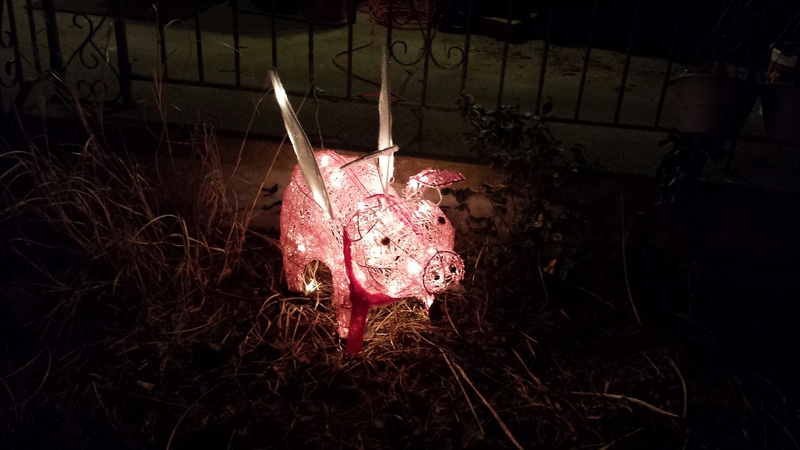 I gave a friend a perfectly nice Christmas pig and she surreptitiously returned it to my lawn in the dead of 7pm 12 months later. 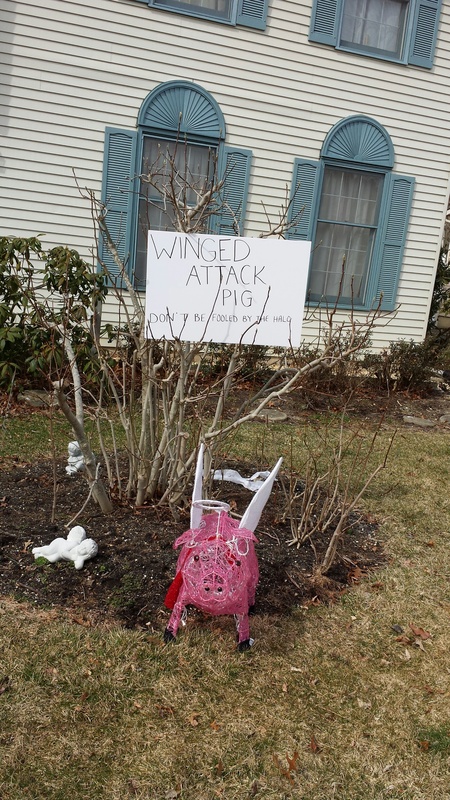 After the season for winged pigs on one’s lawn was over I returned it to her lawn. That’s what happens when you have a sheltered childhood. Until my daughter was five and learned how other children behaved, she was perpetually in pink and white, dainty, and always spotlessly clean, leading many to seriously question her parentage. She was also, unfortunately, quite articulate. There is a special category of hell hearing this story from your mother in law. Have you had this conversation with your child yet? Text to my daughter today. Me: Did you send your Dad a lobster costume? Her: No. it was for you. Me: It was addressed to your Dad and it was for a dog. Her: Well, I read the reviews. They didn’t have one for a cat. Me: Ok. I got the shark tatoos. 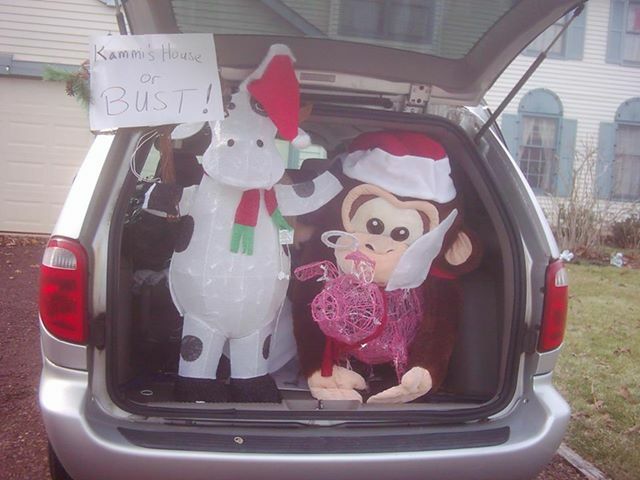 Last year I bought a friend a santa cow and a winged pig and left it on her doorstep. I should have staked them to her lawn with concrete blocks. This year I see this picture posted. I thought perhaps this was just a photo op to annoy me. Apparently not. They came in the dead of night. Or 7 p.m. It isn’t nice to return gifts. The pig no doubt feels unwanted and unloved. We have not a single decoration up this year. But we have a light up flying pig. When I was a kid, blue collar workers from Philadelphia would come down on weekends and live in boathouses, shacks built out over the water on Clam Creek. One lady named Becky, who in my memory was about 80, sat outside on a bench all day and drank beer. All day. I once went in her boathouse and looked in the refrigerator. It had nothing but Budweiser and a jar of relish. My daughter’s friend from high school remembers that my daughter asked me if she could go to a party and I said no. She had to stay home and help fix the bulkhead. I don’t remember saying that. 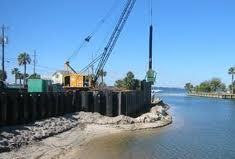 I thought we just used her for test borings and drilling.